To address these shortcomings, we recently conducted some hormone research in the field – literally. Working with a population of indigenous people in the Amazon, we found that oxytocin and testosterone interact in important ways. Tsimane family that live in the Bolivian Amazon. We had previously reported that successful hunters experienced a surge in testosterone that lasted from the moment they made a kill until their return home – a “winner effect,“ rewarding them for their work. Testosterone reinforces the hunting activity and simultaneously helps with muscle regeneration afterwards – similar to the elated feeling we might have after doing sports or other exercise. Now we showed that hunters returning home also have increased oxytocin levels, especially if they were gone for a long time, and if their testosterone was high. 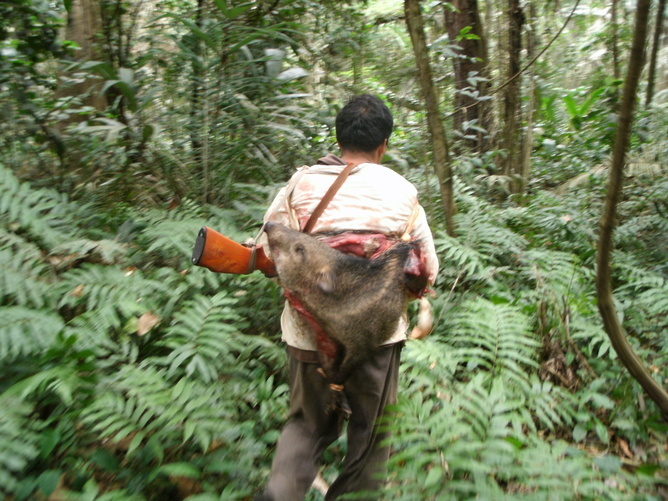 Tsimane hunter heading for home with prey. Given some of the earlier studies, it seems counterintuitive that oxytocin and testosterone would rise in tandem in an individual. Oxytocin tends to make people more social and generous, while testosterone can have the opposite effect. In the case of hunting, testosterone seems inevitably to increase as part of the successful activity. Tsimane man with his two wives and hunted prey after a successful hunt. In this context, it’s also interesting that like testosterone, oxytocin can be involved in muscle regeneration. While more research needs to be done on this, it would make sense for the same hormone to have both social and regenerative functions if the opportunity and need for both predictably coincided, as when coming home after a day’s work. Naturalistic studies like ours can help unravel the evolutionary history and function of these hormones in a way artificial lab studies can’t.